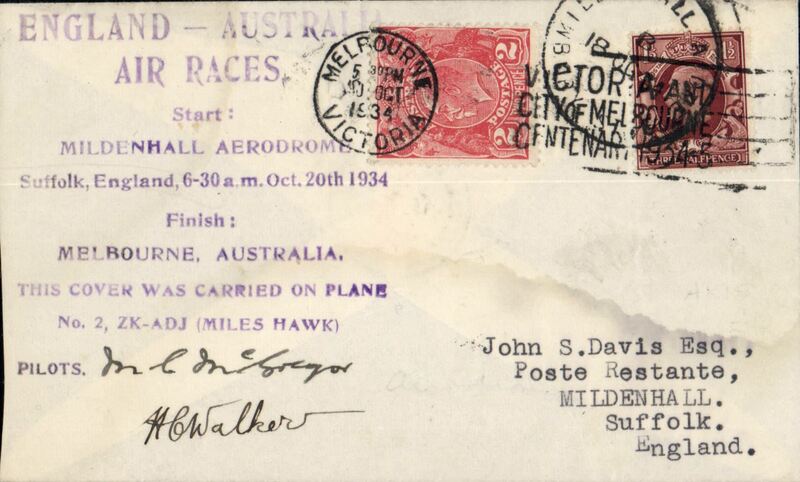 Description: Mac Robertson Race, London to Melbourne, franked gb 1 1/2d canc Mildenhall/18 Oct cds, confirmatory Melbourne arrival mark cds on front tying Australia GV 2d, violet eight line "England-Ausralia/Air Races......" flight cachet, carried by McGregor and Walker in Miles Hawk Major, ZK-ADJ, signed by both pilots. 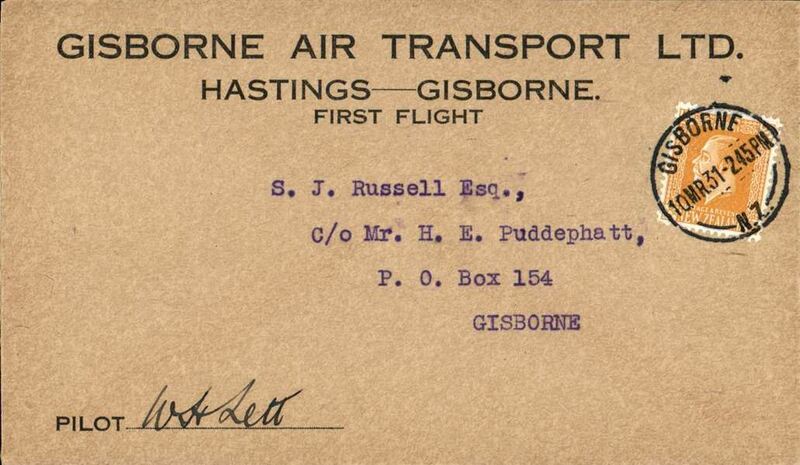 Description: Gisborne Air Transport Ltd, F/F Hastings to Gisborne service, special printed envelope franked 2d, posted on arrival and cancelled Hastings 10 MR 31 cds. 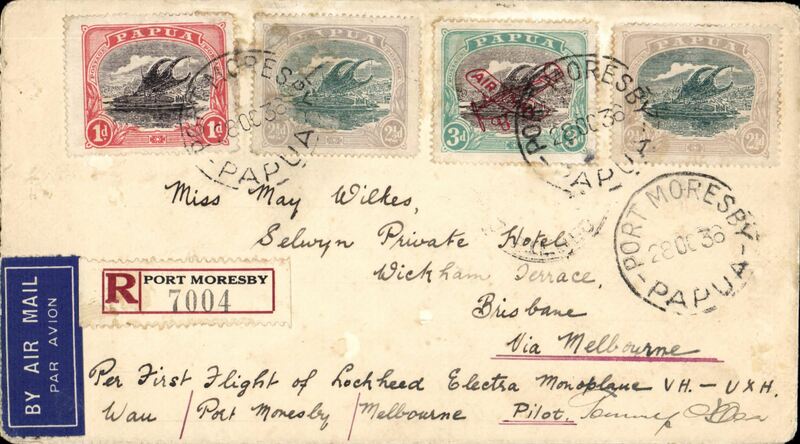 signed by the pilot W.H.Lett. NZAMS Expertisation cachet verso. 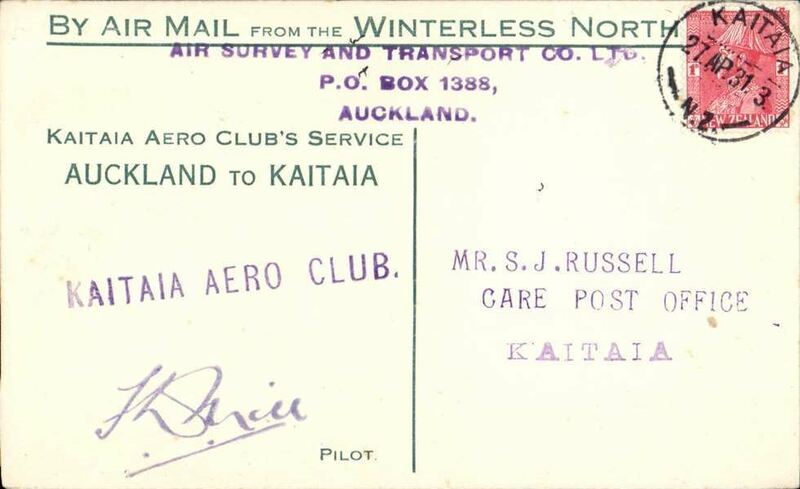 Description: Air Survey and Transport Co Ltd, Kaitaia Aero Club F/F Auckland to Kaitaia, POA, Kaitaia 24/3 arrival ds on front, printed souvenir cover, signed by pilot FD Mill, Air Mail Society of NZ Expert Committee Authentication hs verso. 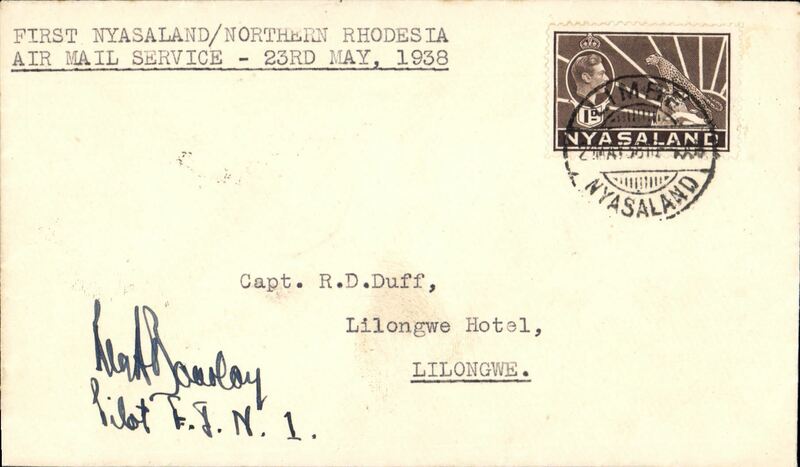 Description: First Nyasaland/Northern Rhodesia/Air Mail Service -23rd May 1938, via the inaugural Chileka-Lilongwe-Fort Jamieson service. 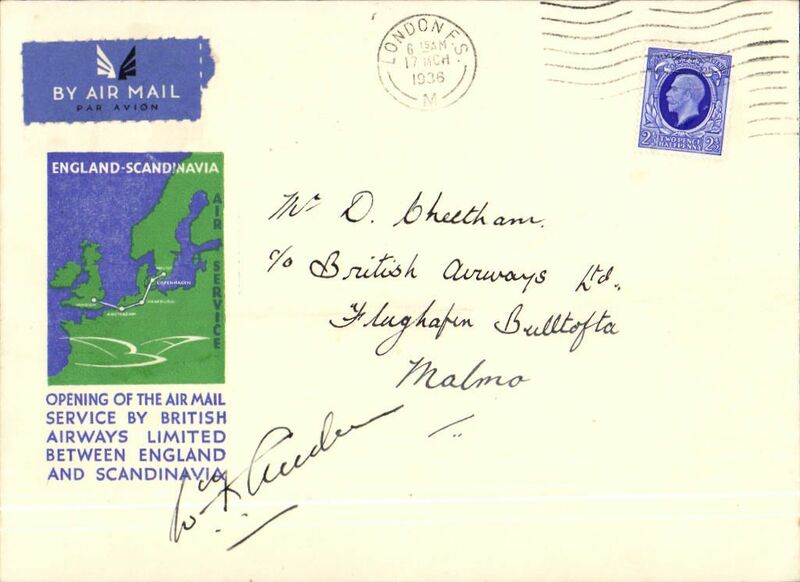 Plain cover franked 1d canc Blantyre 22 May 38 cds 38 and flown to Lilongwe bs 23/5. 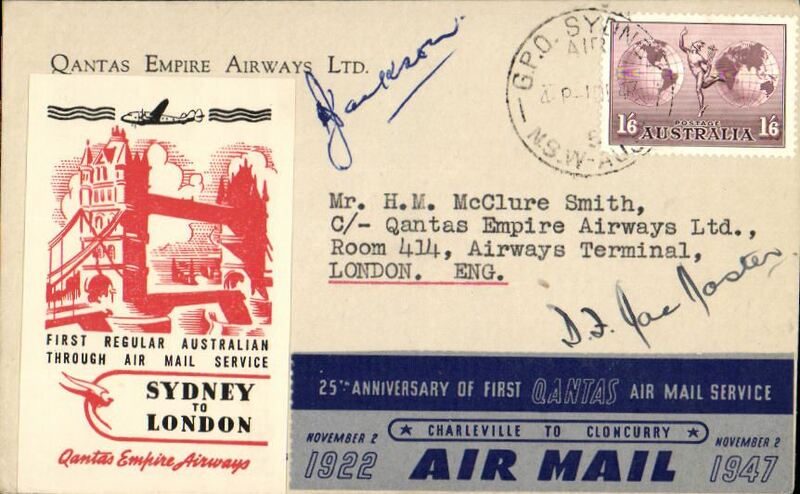 Prior to this inauguration, the route had only been flown by the RAF on the 5th of June 1933 on their return from Air Week in Nyasaland. 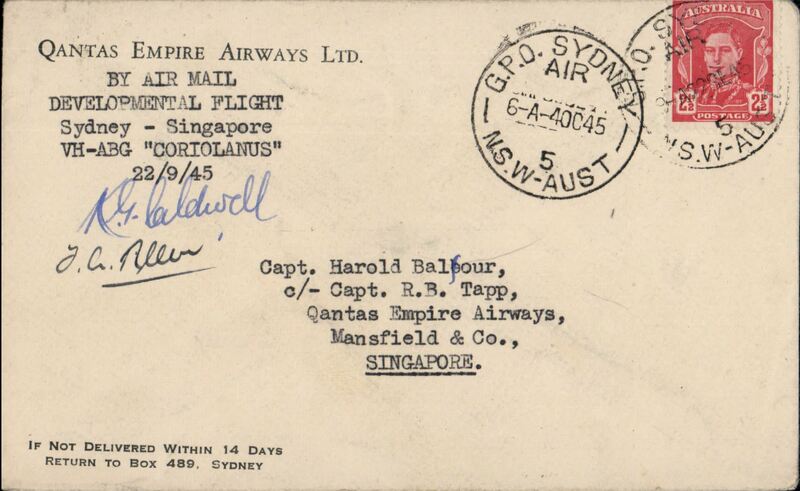 This inaugural flight was made by a DH Dragon Rapide piloted by R.A.Bourlay. 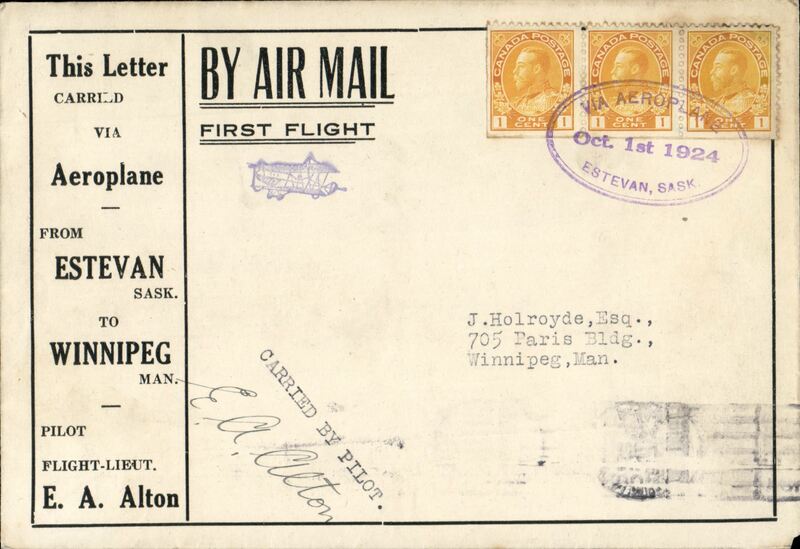 It was an 'All-Up' flight without any extra fee and no cachets or airmail labels were used. 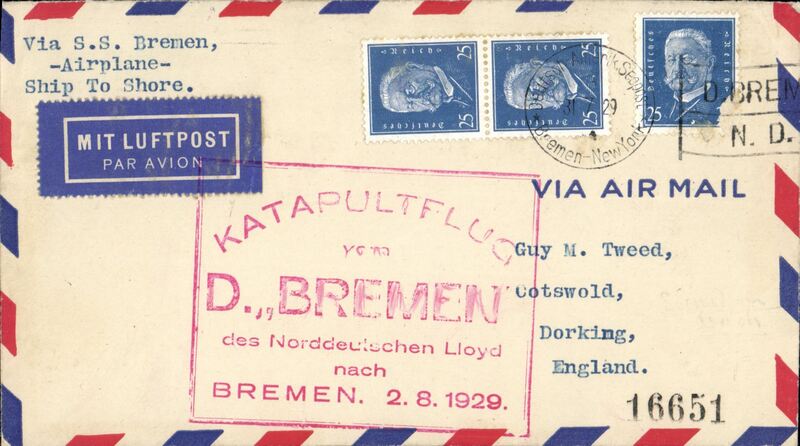 Such covers can only be proved by the date of the Blantyre post mark 22nd May and the Lilongwe back stamp for the 23rd May. 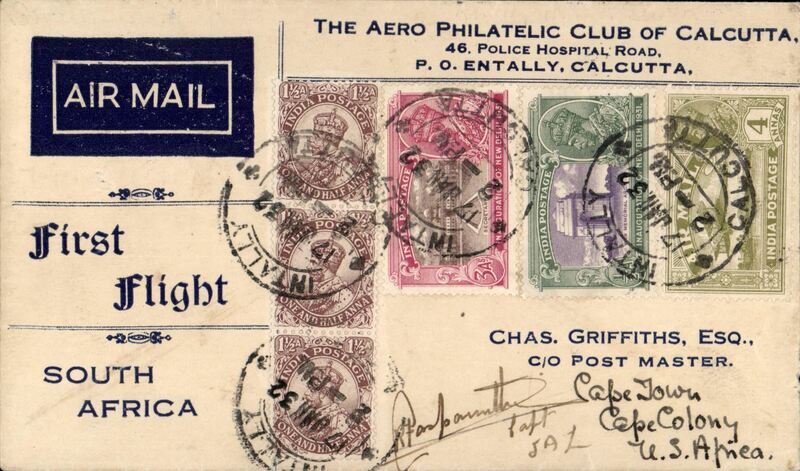 A superb item signed by the pilot, in excellent condition and with particularly clear postal markings. 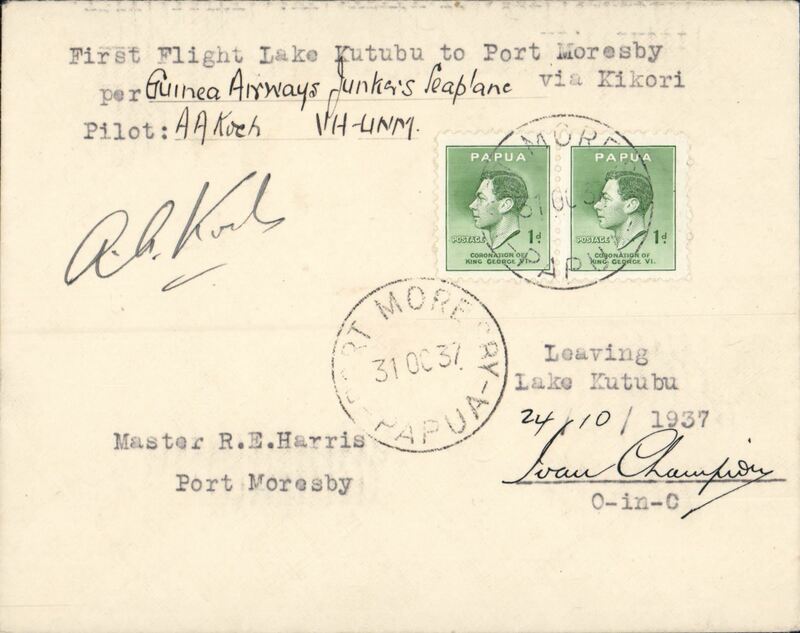 Description: Guinea Airways Junkers Seaplane VH-UNM, F/F Lake Kutubu to Port Moresby, plain cover franked 2d, canc Port Moresby cds, typed 'First Flight Lake Kutubu to Port Moresby via Kikori', delayed arrival at Port Moresby endorsed by Ivan Champion, Asst District Commissioner, signed by the pilot Aubrey Koch, only 17 covers carried, AAMC P121 $600. 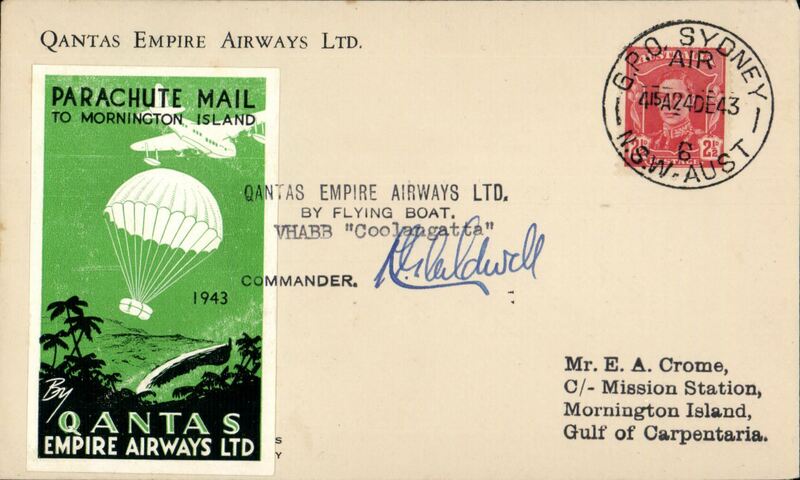 A scarce item in fine condition. 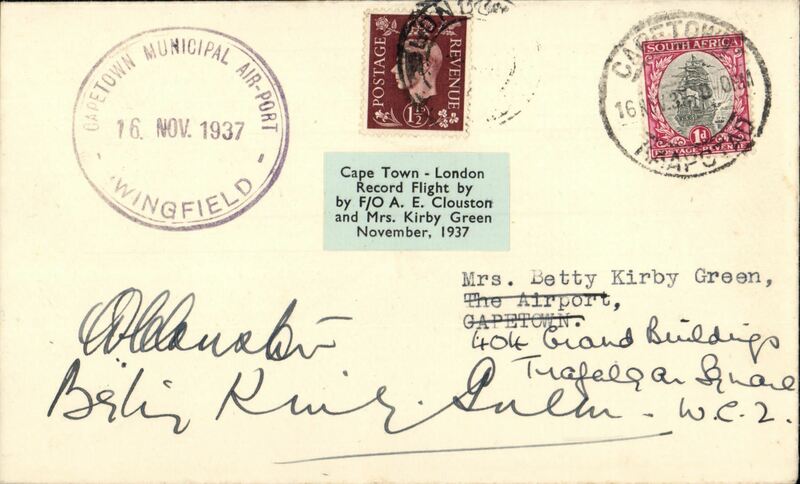 Description: Clouston & Kirby Green record flight Cape Town - London, cover franked South Africa 1d canc Cape Town 16 Nov 37 cds, also GB 1 1/2d's on front and verso canc London and Newport confirming return to GB, and a large rubber "Cape Town Municipal Air-Port/ Wingfield/ 16 Nov 1937" cds and blue/black "Cape Town - London Record Flight by F/O AE Clouston and Mrs Kirby Green November, 1937" labels on front and back. Signed A.E. 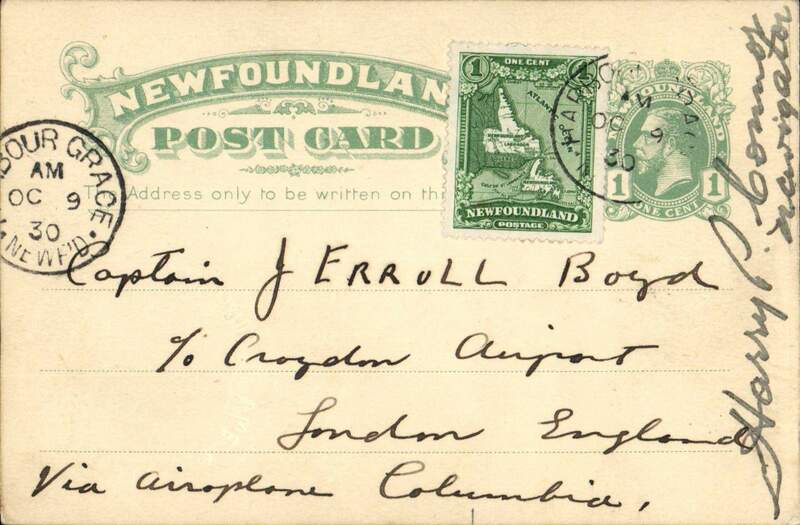 Clouston and Betty Kirby Green. Scarce, VF.